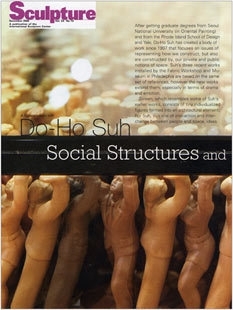 After getting graduate degrees from Seoul National University (in Oriental Painting) and from the Rhode Island School of Design and Yale, Do-Ho Suh has created a body of work since 1997 that focuses on issues of representing how we construct, but also are constructed by, our private and public notions of space. Suh's three recent works installed by the Fabric Workshop and Mu-seum in Philadelphia are based on the same set of references, however the new works extend them, especially in terms of drama and emotion. Screen, which resembles some of Suh's earlier works, consists of tiny individualized figures formed into an architectural element. For Suh, this site of interaction and inter-change between people and space, ideas and expectations, places viewers in a dramatic environment affected by their own presence and their ideas of relationship. The "Paratrooper" series, to which the other two pieces belong, is based on ideas that he had in the late ‘90s. In Paratrooper V, a lone stainless steel figure standing on a stepped pyramid-like base, grapples with countless threads, gathering them into a single rope that connects him to a parachute on the wall. The parachute is embroidered with thousands of signatures, and each of the threads held by the paratrooper connects him to a name. When the weight of these 5,000 threads started to pull the figure, and its concrete base, toward the parachute, Suh had to engineer his metaphor and bolt both figure and base to the floor. While the drama of some of Suh's earlier works involved what was left out or what takes time to notice, here the drama is por-trayed directly, through a physical and visible play of force. In the third of his new works, Paratrooper II, Suh weaves a mesh of white and red synthetic threads into the suspended suit of a paratrooper, which is suspended from a parachute formed of progres-sively smaller suits, presumably of smaller paratroopers. So, the paratrooper becomes the parachute and the parachute becomes the paratrooper, through an intricately social and interconnected process— a web of implied parachutes and people that pass through each other in their transparent connec-tions. In these new works, Suh continues to use forms and metaphors related to architecture and clothing, often expressed in transparent materials, as a means to render psychological, physical, and emotional spaces. Tom Csaszar: One aspect of your pieces, whether they use dog tags as armor or nylon fabric for walls, is that the materials work so well with the images. Do you think in terms of materials and space, or in terms of image first? Do-Ho Suh: No, the image is always first. I think that there is a danger: every artist has a love of materials, both painters and sculptors. I try nor to get involved with the material too much. The idea of transparency in my work is very important, so I've been using materials that tender transparency. It seems that I like transparent fabric, but it is not because I am in love with the particular material. I need that quality. TC: It needs to be transparent to convey the idea you want. DHS:	More like transparency itself. There is no way you can make something that is transparent without physical substance, so I am borrowing material that renders the idea of transparency. Beautiful things happen if you use a fabric: it drapes, and it moves. It has a reference to clothing, which is another one of the ideas that I have been interested in for a long time. But let's say I have a desire to create my piece with-out any material—like architects are tempted to cre-ate a building without walls, which they cannot do; glass is the closest thing, so it becomes the most popu-lar material for architects. There are always physical limits. I think that the idea of transparency came from my background, education, and experience—I lived in a traditional Korean-style house with traditional paintings—but it materialized after I started painting. DHS:	No, here in the States, when I was able to com-pare the two different traditions, cultures, and ways of thinking. I started to see the differences, especially in terms of architecture. It's a very different approach. For example, in Providence, the first house I lived in was a typical 18th- or 19th-century New England building. What I found interesting in Western architec-ture was the distinct separation between nature and the artificial space: there's a wall. You create a space totally separate from the outside. In Korean architec-ture, there are many layers for intermediate spaces, gray areas that don't really belong to nature and the outdoors or to the interior of the building. In order to go to one place, you have to go through many layers of spaces. For example, in the Korean house where I used to live, there are not many walls. It's all windows and doors—and the way you configure those walls. You can reconfigure the space in different ways. And the material of the win-dows and doors is all semi-transparent rice paper, so there's a sense that archi-tecture is very porous. There's a sense of permeability, versus, well, I don't know what to call it. DHS:	Yes, opaqueness, exactly. It was made clearer when I came here and lived in American buildings. I think the way that you relate yourselves to the rest of the world is distinctively different. It was a negotiation with these new sur-roundings, becoming more aware of them and of myself. There's a term in Korean that you "borrow land-scape." That's how you create the environment around the house. So that's why there is ambiguous space and the boundaries are blurry. I think it's almost a cliché, this comparison with Western individualism. A lot of people read in my work the individual versus the collective and Western versus Eastern. All those kinds of things are there, but I think there is more a spatial experience—that I experienced everything by going through different spaces. TC: You've said before that you want to deal with space as psychological and metaphorical as well as physical. TC: Do you think of them as separate in your work or brought together? DHS:	Well, I think that it's all there. DHS:	Yes, it comes out differently from one project to the other. For example, sometimes you have to group certain works simply for conceptual reasons, but it may be due to physical restrictions of the space. TC: Your works raise certain questions and issues. People look at Public Figure (1997) or the work in the current show and say, "It's presenting this point of view on this issue." I see your work, though, as bringing up issues, not resolving them. DHS:	They're very profound issues, issues of the human condition in general. It could be read one way or the other. But these profound issues or concerns are difficult to answer. Basically, there's no answer. TC: So, to play devil's advocate, what's the value of bringing them up in artworks if there is no answer? DHS: I think it's important to me to get to that point. After the long process of thinking and making, you learn certain things and you try to define certain things, and at the end you realize that you are inca-pable of defining them. And then things get more blurry. You try this over and over again in different projects, and you hit the wall every time. But, for me, that process is more important than actually trying to reach the answer. I like not doing it anymore, not trying to understand or have some sort of answer. I don't think that's the way things work in the universe. It's the real experience, the physical experience in the space with the piece. I think that's different than reading a book. Or it might be an easier or better way to address issues or bring up the questions. TC: In Paratrooper V, you have one figure pulling thousands of threads connected to thousands of signatures on a parachute. Are these people that you know? DHS:	Yes, they are somehow connected to me, through my work or through my life. TC: Is the paratrooper a stand-in for you, or more a character in a narrative? DHS: I would say that it's more like a self-portrait, but it could be anyone's self-portrait. The way the signatures were collected is that I started with my closest family and then relatives and friends. They make up about 10 percent of the parachute. And then it expands in different directions. Obviously I don't know 5,000 people. Some people left their names when they came to my shows, where I kept books that I was going to use for this project, and I asked my friends and relatives to collect signatures from their friends. In the end, I don't know them necessarily, but we're all connected one way or the other. TC: The physical effort is portrayed in the threads, which is part of the drama the viewer responds to in the work, in relation to the social and the per-sonal. DHS:	Yes that's all there, and it's really up to the viewer. It's more intangible or invisible, this relation-ship between people and how an individual becomes a person, a being. When you gather all those relation-ships to one point, that's the point where and when you become you. And other people have that kind of web of invisible relationships as well. It's something that has passed through generations. TC: The room is suffused with red light reflected from the threads, an intangible result of what you are looking at. DHS:	None of the threads touch each other, and when they meet it is at the point where the figure is hold-ing them. I wanted to focus on that moment and the place where it all comes together. It's also related to an Eastern way of thinking and some thoughts from Buddhism. This piece was not really about this show. There was a moment when I felt that you don't really exist alone, there are so many factors, relationships, and supports that allow you to come to this point. I had to acknowledge that—whether they were good relationships or bad relationships. It's not something visible, but by making this piece, stitching each per-son's signature, and trying to bring each thread one by one to one point, it became a gesture to appreci-ate all the supports, concerns, and considerations of other people. TC: A physical, spatial gesture? DHS: Yes. These are a little different from my previ-ous works, which were more cur and dry. Although at the core, those works and these works share the same ideas. TC: Ideas of social values? Spatial or cultural ideas? DHS:	Let me try to explain. The starting point was more of a personal need to figure out identity. But you don't exist outside of a context. So it was natural that this range of concerns and cultural issues came into the work. It's not separable, it's all mixed: you cannot separate the individual from the large pic-ture. The beginning was an attempt to define what is individual and what is collective. Then it becomes more and more ambiguous as you make the work. It's nor really about one issue. Sometimes I think that the "Paratrooper" pieces are more spiritual than the others. Until a writer reviewed the first version of the "Paratrooper" pieces, I didn't know that Japanese soldiers carried embroidered handkerchiefs during World War II. Each soldier had a white handkerchief prepared by his mom with red thread to make a collection of signatures of all the people he knew, his relatives and family. The hope was that carrying the handkerchief would protect him. I think that my piece has that desire, like that of people who send their sons and daughters to war. Somehow that is related to my desire to make the parachute pieces. But at the same rime, as in my other works, you are trying to gather these relationships, trying to quantify and materialize this thing, and struggling to hold on to it. At the same time, these are the relationships that pull you, and you struggle. Again, it's very ambig-uous as to whether the figure is trying to gather this thing or escape it. I think that's what life is and what relationships are. I'm using the word "relationship" here, but I could nor find the right word in English. I looked it up in the dictionary and in Korean it's the word "inyeon." Usually I make a piece and then show it either in the States or outside of Korea. "Paratrooper" was the first piece that I made in Korea and showed there for the first time. The opening was an overwhelming experience for me. People cried, really cried. When I showed the same piece in New York, I think that it was seen differently. People tried to project their ideas. It was in April, right after the Iraq war had started. A lot of people thought that it was an image of an American GI, probably commenting on the war in Iraq. But in Korea, no, nothing about the military. It was nor seen as being about the military at all. My understanding was that this was because of the history of Korea and the current situ-ation, including that everyone has to go into the military. It's part of Korean culture. I think that there is less distance there probably. People can iden-tify themselves in a wider way. I find that my work has always been read differently from one place to the other, which is fascinating. It brings more inter-esting meanings. I think that the idea of "inyeon" plays a great role. It's an ingrained idea in Eastern cultures, probably from Buddhism. "In" is a cause, as in cause and effect," and "yeon" is like a rela-tionship or "link" but it doesn't have to be a physi-cal link. For example, you and I met for the first time today, but in order to meet and talk for an hour, that means that we have some sort of connection—it's not by accident. Either we knew each other in a past life or something was passed on to us from an older generation. It's not just one gen-eration, this past life, it can go back beyond that. Nothing is really acciden-tal, it's all related. I think people in Korea were able to project their lives onto this piece imme-diately and that it triggered a very emotional response. It was the response of many people. I met a Japanese curator who wants to show that work in Japan, she got it right away. In Japanese "inyeon" is "eng," which is from the same Chinese character. It's like the idea of karma, it's a karmic energy. When you see a person, you don't see just the person standing in front of you—you see their background, their family or ancestors, the invisible webs of relationship or information. In the U.S., it's more person to person, more on the physical level. Like when I was talking about architecture, I think that the way I see people is more blurry. TC: And artists can give some sense of material qual-ity to that web through their works? DHS:	That's why I've been using unconventional materials. In Paratrooper V, it's a weird combina-tion, stainless steel and concrete, then the thread and fabric, it's fuzzy and you lose the sense of depth. Hopefully this takes you beyond the materiality of the piece. TC: You often invert or suspend expectations. A parachute is something that lets you float to the ground. You are being pulled by your parachute or struggling against it. In Paratrooper II, the figure is hanging from a parachute of smaller paratrooper suits. DHS: When I came up with the idea I saw it as one whole thing, a whole process, from the dropping to the landing, nor just a parachute in the air. Both a vertical and a horizontal image came into my mind almost simultaneously; it was more like one piece together. I wish they had a space in the same building so you could see both pieces at the same time. I can't really separate them. Without the parachute the sol-dier would crash to the ground and die, so it is cru-cial to survival. Then once you land the thing, you have to gather it, and it gives you a hard time, you can get tangled. So, the parachute works both ways. TC: Would you see these works as connected more to the history of sculpture or to a sense of innovation? DHS: I've never really thought about it. TC: That's not an important consideration for you? DHS: No. It's nor my job, I don't think. There are things that you have to do no matter what other people say. If I knew anything different I would probably make better work, but I don't. I've been showing since ‘97, and my first solo show in New York was in 2000. It hasn't been that long a time. But I find that I go back to things that I studied before. I've kept a sketchbook since I was at RISD, and I was flipping through it the other day and found a series of doodles. I don't believe that I was thinking then what I'm thinking now, but those doodlings were related to this work. It's interesting how your mind works and how you get fixated on an idea. It comes over and over again. I don't know whether it's a ges-ture of trying to escape from that idea, but I find myself trying to see these issues from different angles. That could be a limitation, but I cannot help it. These are the things that interest me the most. I try to under-stand why, at the very beginning, did I want to address these issues in terms of personal space. Why did I start from architecture? I can explain it, but there are other things that I can't explain. Why something with some-thing else? I think that it's because somehow there was a very traumatic experience at a subconscious level or I'm just very good at it—at dealing with space— or comfortable with it. I don't know which one it is. TC: You mean repeating structures or figures to make us feel the space? DHS:	No, maybe I was just jumping around. Some-how my work was generated by contemplating archi-tecture. I started to think about the notion of personal space and tried to define the space between this per-son and other people. Usually when I place my work, it's very site specific. I don't make a sculpture in the Modernist sense. It's always very contextual. For example, the screen piece is a sculptural object, I guess. These three pieces are probably the most like sculptural works, but I make an effort to plan care-fully and to think about viewers' movements, how they might interact with the piece, and how they might experience the space differently with my work. Depending on how I place the piece, it could be a totally different experience—I'm very interested in those ideas. Even if I'm nor making site-specific work, still I put a lot of effort into placement. Screen casts a shadow on the wall. I was playing with the lights and trying to bring it out, nor too much, very subtly, but hopefully people can see the shadow too. And they will realize when they see the other audience on the other side of the screen that their experience of or relationship with this piece changes constantly because of the other viewers, depending on the lighting. When you walk around, you start to see the shadow and the color and its three-dimensionality, and the figures come out more, but then as you turn around the corner, the figures start to lose color, and it becomes a silhouette, almost like a shadow on a wall. TC: Do you want viewers to be most interested in the perceptual qualities of the piece, in the ideas they take away from it, or the emotions or spiritual ambience? DHS: I want viewers to become part of the piece and more aware of their surroundings. For example, people can go into my other architectural pieces. I think the screen in a way is less aggressive than my other architectural pieces. Meaning changes and experience changes as you see other people on the other side. I want the audience to experience my pieces more spatially. That would be a perceptual issue, but more through movement, more a physical experience. Then, hopefully, they get something out of the ideas behind the work, whatever they are. But it's also play-ful. It's easy to engage with my work on a very basic level. I'm very concerned about that part too. There are different levels of audience, some are more edu-cated in terms of looking at art, but there are also people who don't know anything about art history. I try to make something that touches every level of the audience. If people find that a work is fun or the color beautiful, that's OK. But there are other things they can find in my work and hopefully that causes them to pause for a minute and think about very fundamental issues. Tom Csaszar is a painter and writer in Philadelphia.